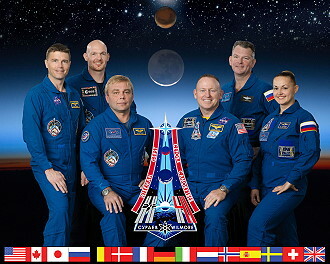 Given names: Maksim Viktorovich Gregory Reid Alexander Aleksandr Mikhailovich Yelena Olegovna Barry Eugene "Butch"
Launch from the Baikonur Cosmodrome (Aleksandr Samokutyayev, Yelena Serova and Barry Wilmore with Soyuz TMA-14M). 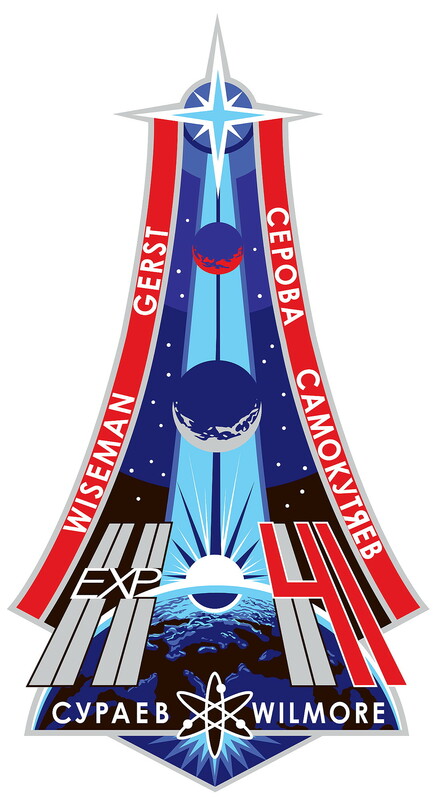 Maksim Surayev, Reid Wiseman and Alexander Gerst were onboard since May 29, 2014 (arrival with Soyuz TMA-13M). ISS Expedition 41 began with the undocking of spacecraft Soyuz TMA-12M on September 10, 2014 at 23:01 UTC. 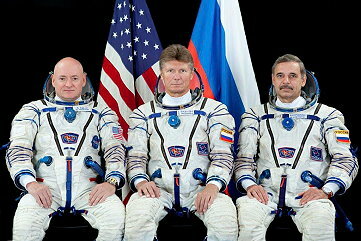 The former Expedition 40 (Aleksandr Skvortsov, Oleg Artemyev and Steven Swanson) returned safely to Earth. With the arrival of Soyuz TMA-14M on September 26, 2014 the Expedition 41 became a six-person-crew. 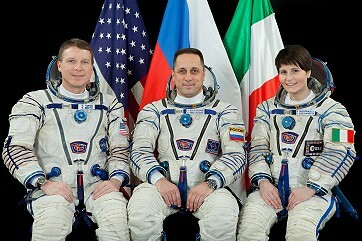 Soyuz TMA-14M carried Aleksandr Samokutyayev, Yelena Serova and Barry Wilmore to the space station. The Dragon CRS-4 or SpX-4 commercial cargo craft has completed a two day trip to the International Space Station after launching on the company's Falcon 9 rocket from Space Launch Complex-40 at Cape Canaveral Air Force Station in Florida at 05:52:03 UTC September 21, 2014. 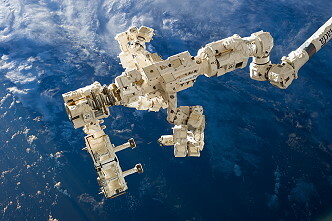 Reid Wiseman and Alexander Gerst were at the controls of the robotics workstation in the Cupola when the Canadarm2 grappled Dragon at 10:52 UTC on September 23, 2014 and berthed to the Harmony node on September 23, 2014 at 13:21 UTC. 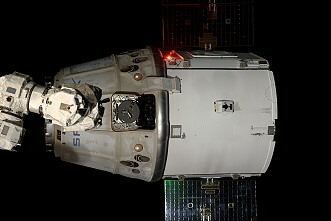 Later, the crew successfully opened the Dragon hatch and ingressed the vehicle. 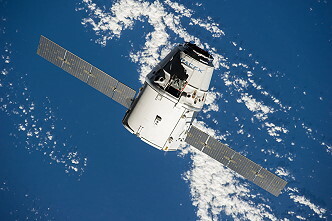 About 5,000 pounds (2,268 kg) of NASA science investigations were aboard SpaceX's Dragon spacecraft. 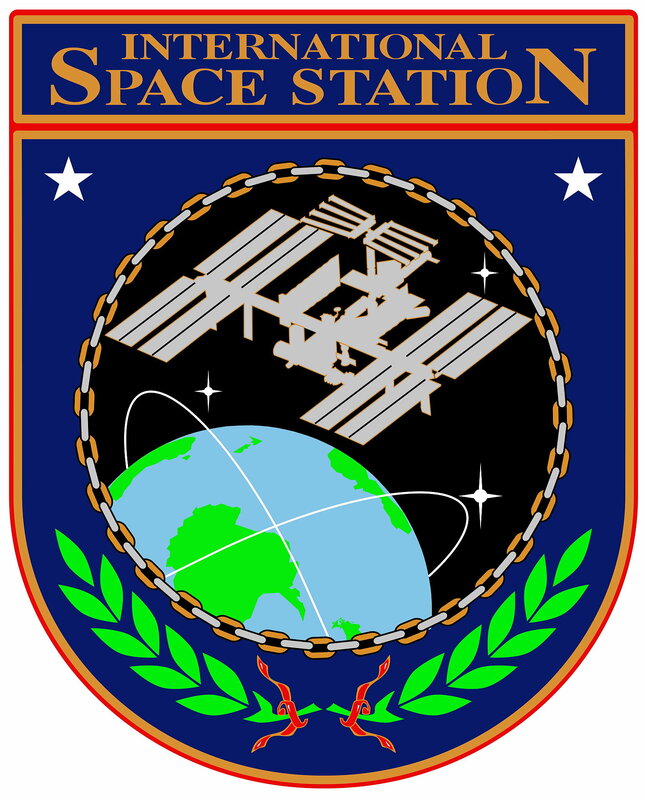 One of the new Earth science investigations heading to the orbital laboratory is the International Space Station-Rapid Scatterometer. 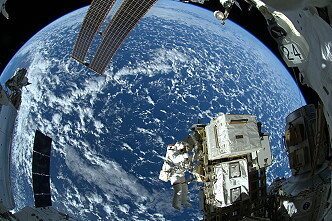 ISS-RapidScat monitors ocean winds from the vantage point of the space station. This space-based scatterometer is a remote sensing instrument that uses radar pulses reflected from the ocean's surface from different angles to calculate surface wind speed and direction. This information will be useful for weather forecasting and hurricane monitoring. Dragon also will deliver the first-ever 3-D printer in space. The technology enables parts to be manufactured quickly and cheaply in space, instead of waiting for the next cargo resupply vehicle delivery. New biomedical hardware launched aboard the spacecraft will help facilitate prolonged biological studies in microgravity. 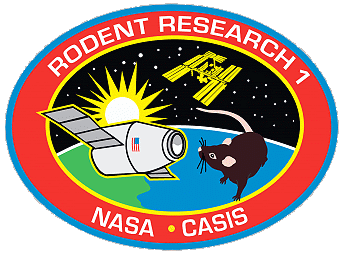 The Rodent Research Hardware and Operations Validation (Rodent Research-1) investigation provides a platform for long-duration rodent experiments in space. These investigations examine how microgravity affects animals, providing information relevant to human spaceflight, discoveries in basic biology and knowledge that may have direct impact toward human health on Earth. 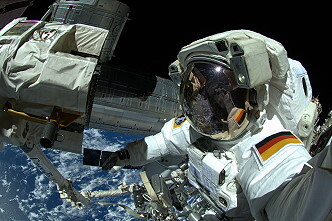 The first spacewalk in this expedition was performed by Reid Wiseman and Alexander Gerst on October 07, 2014 (6h 13m). The astronauts moved a failed cooling pump from temporary to long-term storage on the station's truss. They also installed a new relay system that will provide backup power options to the mobile transporter, which moves the large robotic arm around the out outside of the space station. Reid Wiseman and Barry Wilmore ventured out the International Space Station for the second EVA on October 15, 2014 (6h 34m). The two-man team replaced a sequential shunt unit electronics box, a voltage regulator, on the starboard truss that failed in mid-May. Although the station has since operated normally on seven of its eight power channels, the voltage regulator replacement is considered a high priority. 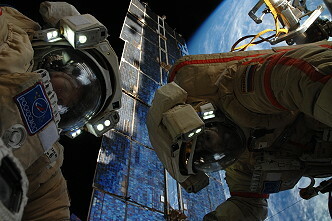 The third EVA in Expedition 41 war a Russian spacewalk and performed by Aleksandr Samokutyayev and station Commander Maksim Surayev on October 22, 2014 (3h 38m). 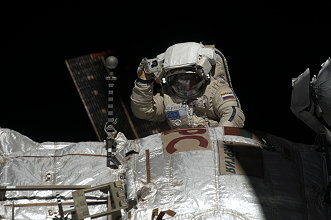 The cosmonauts removed and jettisoned several pieces of hardware no longer needed on the Russian segment of the station and conducted a detailed photographic survey of the exterior surface of the Russian modules. After delivering almost 5,000 pounds (2,268 kg) of supplies and experiments to the International Space Station during a month-long stay, the SpaceX Dragon cargo spacecraft left the orbital laboratory on October 25, 2014 at 13:56 UTC. The Dragon spacecraft was detached from the Earth-facing side of the station's Harmony module and unberthed through commands sent by robotic ground controllers in mission control at NASA's Johnson Space Center in Houston operating the Canadarm2 robotic arm. Mission control maneuvered Dragon into place then turned it over to Expedition 41 robotic arm operators Reid Wiseman and Barry Wilmore for release. 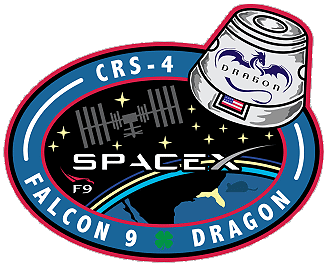 Space station and SpaceX officials delayed Dragon's departure four days from the originally scheduled date of October 21, 2014 because of high sea states in the splashdown and recovery zone west of Baja California. 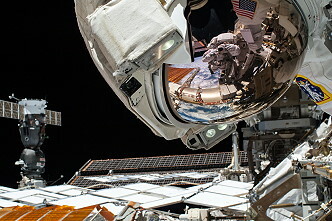 It returned about 3,276 pounds (1,486 kg) of cargo, including science samples from human research, biology and biotechnology studies, physical science investigations and education activities sponsored by NASA and the Center for the Advancement of Science in Space, the nonprofit organization responsible for managing research aboard the U.S. national laboratory portion of the space station. The capsule splashed down on October 25, 2014 at 19:39 UTC 480 km west of Baja California. Progress M-24M left the International Space Station on October 27, 2014. 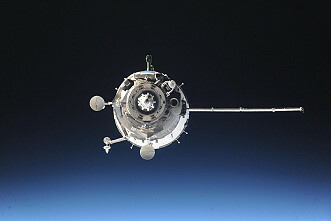 The unpiloted Russian cargo spacecraft arrived at the orbiting laboratory in July 2014 and undocked from the space station's Pirs docking compartment at 05:38:24 UTC. Upon leaving the ISS, the cargo spacecraft would be taking part in a scientific experiment until November 19, 2014 to study the impact of its engines on the plasma in the Earth's ionosphere. At 23:46UTC the freighter entered the atmosphere and was destroved over the South Pacific. Orbital Sciences Corp. attempted to launch its next mission to resupply the International Space Station on October 28, 2014 at 22:22:38 UTC from the Mid-Atlantic Regional Spaceport's Launch Pad 0A at NASA's Wallops Flight Facility in Virginia. The Antares rocket making only its fifth flight exploded seconds after launch from the Virginia coast , erupting in a spectacular fireball and destroying an uncrewed Cygnus cargo ship in a disheartening failure for NASA's commercial space station resupply program. 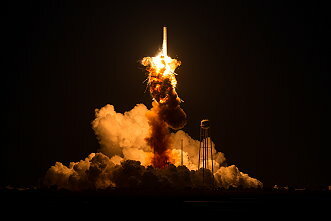 The mishap occurred about 15 seconds after liftoff from the Mid-Atlantic Regional Spaceport at NASA's Wallops Island Flight Facility as the 139-foot-tall (42.4 meters) two-stage rocket climbed away on the power of its two Russian-built first-stage engines. 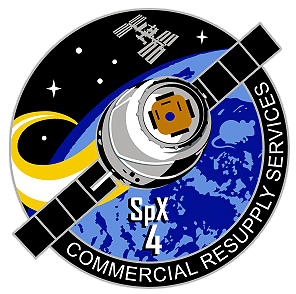 Continuing the tradition of naming its spacecraft after astronauts who have made significant contributions to spaceflight, Orbital dubbed this Cygnus resupply ship the SS Deke Slayton. The name is a tribute to original Mercury 7 astronaut Donald "Deke" K. Slayton, who flew on the Apollo-Soyuz Test Project (ASTP) mission in 1975 and championed commercial space endeavors after retiring from NASA in 1982. Donald Slayton passed away in 1993. Cygnus was filled with almost 5,000 pounds of supplies, including science experiments, crew provisions, spare parts and experiment hardware. The Progress M-25M resupply ship launched at 07:09:42 UTC October 29, 2014 from the Baikonur Cosmodrome in Kazakhstan, with 2,350 kg of food, fuel and supplies for the station's Expedition 41 crew. Progress M-25M made its four-orbit, six-hour trip to the space station and docked with the Pirs docking compartment at 13:08:14 UTC. 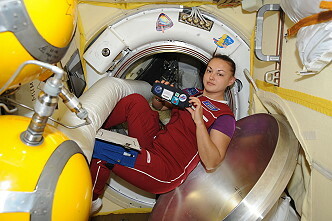 Seedling growth, observation of meteors entering Earth's atmosphere and studies of animal biology and bone and muscle physiology define the research of Expedition 41. Model organisms, such as plant seedlings and small fish, traveling to the space station will help advance our body of scientific knowledge about the influence of microgravity on cells. Model organisms are non-human species with characteristics that allow them easily to be maintained, reproduced and studied in a laboratory. Taking these organisms to space allows for examination of growth and development and physiological, psychological and aging processes without the impact of gravity. 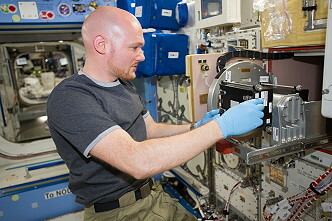 Biological Research in Canisters-19 (BRIC-19): BRIC hardware has supported a variety of plant growth investigations aboard the space station. The new BRIC-19 investigation will focus on the growth and development of Arabidopsis thaliana seedlings in microgravity. A. thaliana is a small flowering plant related to cabbage. Researchers hope to get a better understanding of how the growth responses of plants are altered by growth in microgravity. The seedlings will be preserved and returned to the ground for evaluation. While the BRIC hardware helps to maximize research and minimize space and crew time, it also adds to the collective body of knowledge about basic plant growth phenomena and may help improve growth and biomass production to benefit farming practices on Earth. Meteor Composition Determination (Meteor): Meteor is a new space station payload that will enable the first spacebased observations of meteors entering Earth's atmosphere from space. 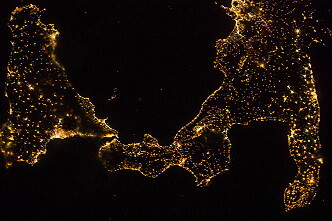 Meteors are somewhat rare and are difficult to monitor from the ground because of Earth's atmosphere. Meteor uses high-resolution video and image analysis of the atmosphere to ascertain the physical and chemical properties of the meteoroid dust, such as size, density and chemical composition. Since scientists usually identify the parent comets or asteroids for most meteor showers, the study of the meteoroid dust from the space station provides information about the parent comets and asteroids. Investigating the elemental composition of meteors adds to our understanding of how the planets developed, and continuous measurement of meteor interactions with Earth's atmosphere could spot previously unforeseen meteors. Effects of Gravity on Maintenance of Muscle Mass in Zebrafish (Zebrafish Muscle): The Zebrafish Muscle investigation will observe the effects of microgravity on the zebrafish, Danio rerio, a tropical freshwater fish belonging to the minnow family. The goal of the study is to determine whether zebrafish muscles weaken in microgravity similarly to human muscles, and if so, isolate the cause. Results from the Zebrafish Muscle investigation may help identify molecular changes involved in the deterioration of muscles exposed to microgravity. This data can help scientists develop new treatments for weakened muscles. The findings could potentially benefit patients on extended bed rest or with limited mobility. In addition, this information would aid researchers in developing countermeasures for muscle weakness in astronauts living in microgravity during extended missions. Osteocytes and mechano-transduction (Osteo-4): The Osteo-4 study examines the effects of microgravity on the function of osteocytes, the most common cells in bone. These cells reside within the mineralized bone and can sense mechanical forces; but, researchers do not know how. This study allows, for the first time, direct analysis of the changes in the physical appearance and genetic expression of bone cells in mice living in microgravity aboard the space station. This investigation may significantly advance the knowledge of the role of mechanical forces, or lack thereof, on osteocyte functions and further enhance understanding of these cells. Results derived from this study could have significant implications for treatment of bone disorders related to disuse or immobilization such as osteopenia (low bone density), osteoporosis or even paralysis. This may also assist researchers in developing additional mechanisms to combat bone density loss in crew members living aboard the space station. 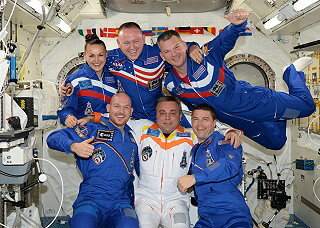 Finally the station command changed from Russian cosmonaut Maksim Surayev to US astronaut Barry Wilmore. 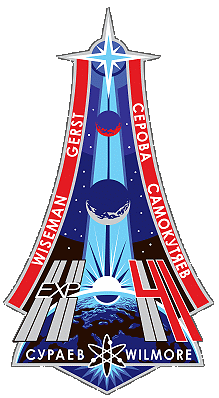 With undocking of Soyuz TMA-13M, carrying Maksim Surayev, Reid Wiseman and Alexander Gerst, on November 10, 2014 at 00:30 UTC the Expedition 41 concluded and the new ISS Expedition 42 began. Zebrafish Muscle (Effects of the gravity on maintenance of muscle mass in zebrafish).